The Mackie MDB-2P is a stereo passive direct box from the Mackie MDB series. It can be used both for live performances and in a recording studio and is especially well suited to electronic musicians using stereo sources such as keyboards and synthesizers. Featured on the MDB-2P are dual 1/4" high-impedance inputs with Thru outputs, and dual low-impedance XLR outputs. These XLR outputs are equipped with Ground Lift, which can effectively reduce unwanted ground loop hum. Despite its remarkably affordable price, this DI is one of the best around for producing a clear, distortion-free sound. Direct boxes are an essential tool for any stage or studio. They make it easy to get clean, low-noise audio to a mixer no matter what instrument you are using. Available in four versatile models, our ultra-affordable DI's offer the Mackie sound quality that you expect with Built-Like-A-Tank construction for maximum reliability. From acoustic guitars to laptops, be ready for anything with MDB Series direct boxes. With four models to choose from, you can get the perfect match for your instruments. Acoustic guitars and keyboards are right at home with the MDB-1P and MDB-2P. High output instruments will appreciate the extra headroom in the MDB-1A. From the inside out, MDB Series direct boxes are built to last. Thick steel chassis, impact resistant corners, and long-wearing jacks will keep these in your bag for years to come. MDB Series direct boxes offer excellent noise performance and transparency. Whether you are in the studio or performing on stage, your instruments will always sound as good as they do at the source. The MDB-USB is the ultimate way to get pristine digital audio from your laptop directly to a mixer or front-of-house in a venue. 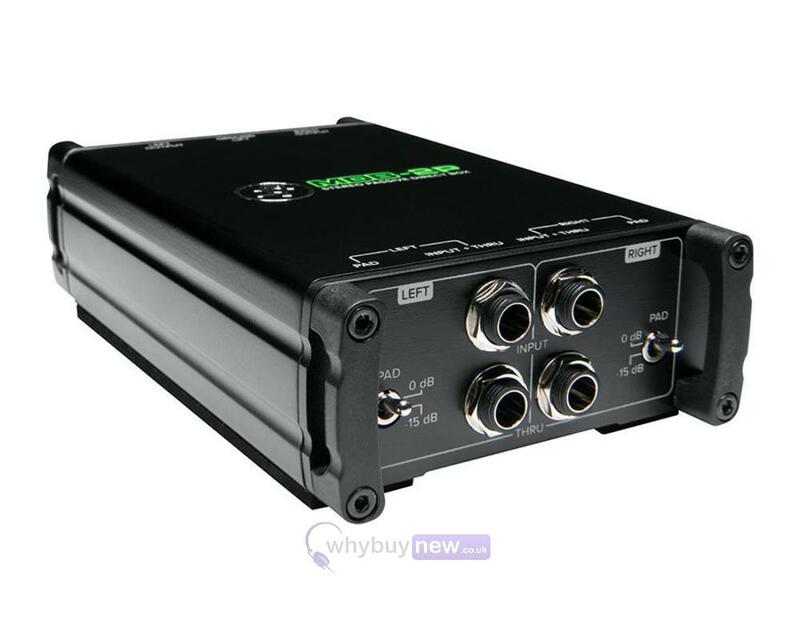 Great for stereo sources like keyboards and synthesizers, the MDB-2P is an essential tool for electronic musicians, live sound venues, and recording studios. The MDB-2P Stereo Passive DI Features dual 1/4" high-impedance inputs with Thru outputs and -15dB pads, and dual low-impedance XLR outputs with ground lift.